1986 marked the starting point of what might be described as the second of Hip Hop’s major battles to be played out on wax, the so-called ‘Bridge Wars’, a lyrical battle waged between the crews of New York’s South Bronx and Queensbridge projects (from which the battle takes its name). The battle centers around claims over hip hop’s origins in New York, crews from the New York boroughs of the Bronx and Queens each stepping to the mic in a series of releases to defend the honour of their neighbourhood. Whilst BDP’s response was viewed at the time as an attempt to defend the Bronx as rightful owner of it’s claim to be Hip Hop’s birthplace, subsequent interviews with BDP’s KRS-One suggest there was more to the feud than met the eye. Prior to the release of ‘The Bridge’, KRS-One had approached Queens’ Juice Crew affiliate Mr Magic, seeking interest in his group ‘12:41’ (an earlier incarnation of BDP of which Scott La Rock was also a member). Magic had rejected the track causing some resentment between the two camps. Although arguably the original source of the feud, the absence of Magic’s approval did not prevent the group from forging a career and in the same year they released the single ‘Succe$ i$ the Word’ on Fresh Records. 1987 saw the battle escalate with Shan and Marley Marl responding with the track ‘Kill That Noise’ appearing on Shan’s ‘Down By Law’ LP, but the track was soon eclipsed by BDP’s lyrically bold ‘The Bridge Is Over’. Although arguably the strongest lyrical blow in the series of releases, the battle continued with Juice Crew member Roxanne Shante (also centrally involved in the Roxanne Wars) taking a shot at KRS-One in her track ‘Have A Nice Day’, ghostwritten by fellow Juice Crew member Big Daddy Kane. Shan’s ‘Juice Crew Law’ contained similar sentiment. As with the Roxanne Wars, the popularity of the battle records prompted a number of artists not directly involved to step up and give their take on events. Philadelphia’s Cool C weighed in with ‘Juice Crew Dis’ and Queens MC Butchy B responded in his track ‘Go Magic’ / ‘Beatin Down KRS’, the former a promo cut for Queensbridge DJ Mr Magic. Queens duo DJ Rockwell Noel and the Poet further contributed to the feud with “Taking U Out’. The heat of the battle had certainly subsided by 1988 but that didn’t prevent BDP’s KRS-One making reference to it in both 1988’s ‘My Philosophy’ and 1990’s ‘Blackman In Effect’. Into the ‘90s vague references were made by a number of artists but the battle was in essence over. 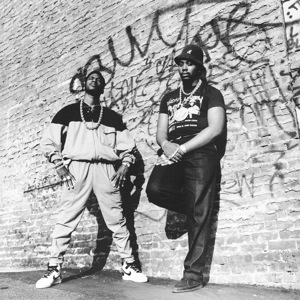 Putting matters beyond doubt was the release of the 2007 collaboration album between KRS-One and former Juice Crew producer Marley Marl entitled ‘Hip-Hop Lives’, officially putting the feud to bed and celebrating the legacy of one of Hip-Hop’s most important battles played out on wax.